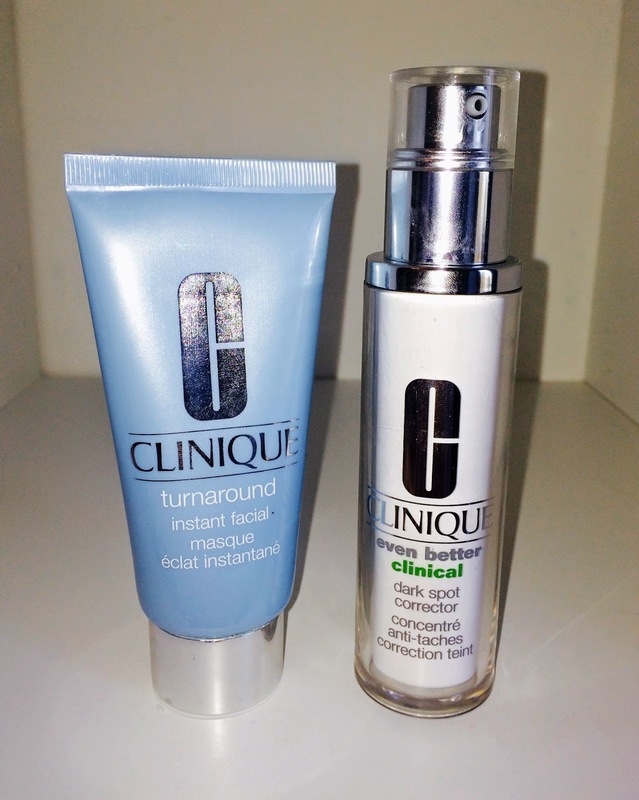 I have two new high end products that I want to share and these are the turnaround instant facial masque and the even better clinical dark spot corrector both by Clinique. The facial mask retails at £35 which is probably the most I've ever spent on a face mask. This is a face mask as well as a scrub as it has tiny grains in it which help to exfoliate your skin. This product is oil free and fragrance free and is apparently suitable for all skin types which I think is great as I know that a lot of people with skin conditions such as acne and eczema can struggle to find beauty products such as scrubs that won't irritate their skin. I like that this has no perfume in it as the less unnecessary chemicals I can put on my face the better. You can leave this mask on for up to 5 minutes or you can just use it as a scrub. I really liked this product as it left my skin feeling fresh and smooth however one thing I am unsure about is the glitter that's in it. It is also water based however this does not mean that it doesn't have a long list on non-natural ingredients, which it unfortunately does. For this price I do not think that I will be buying it again as there are other non-allergenic scrubs on the market that can do the same job for less. The next product I tried is the dark spot corrector and this one retails at £42. This product is definitely not a miracle treatment as you may think from the price. I apply it twice daily and very slowly I think it has improved the colour evenness of my skin however it did not work as well or as quickly as I had expected. I genuinely thought that this was going to be any answer to even flawless skin but its definitely not. I have found that to get rid of blemishes and spots the best thing to do it drink gallons of water whether its inconvenient or not after about a week and a half you will start to notice a difference. Don't drink over 2 litres a day though despite what anyone says as it can damage your kidneys! Clinique do not test any of their products on animals except from in China where companies are required by Chinese law to do so. I personally think that if a company was really against animal testing then they would refuse to sell in countries which require it. Furthermore if all companies that do not test on animals refused to sell in China then I believe that China may consider a law reform. Leave a comment below and let me know if you have tried any of these or what your views were on any other Clinique products that you have tried!